The real question is…Who wouldn’t want to live here? 1. We are fearless. Years of driving through treacherous snowstorms, ice storms, snow-ice storms, etc. have trained us to take the roads by the balls no matter what the circumstance. We will never miss your birthday party Aunt X or your championship basketball game Cousin Y, because we are simply not afraid of anything. 2. When everyone else is freezing, we’re just slightly chilled. This allows us to keep our heat bills extremely low because we are able to wait until the absolute last. possible. second. to turn the heat on while only experiencing minor discomfort. It’s cold…but is it ever really that cold? 3. In addition to building up a Godlike alcohol tolerance, we ROC locals have been given ample time to perfect our gaming skills. Board games, card games, video games…We have mastered them all. What else is there to do when your car is buried under 2 feet of snow and your landlord is too cheap to plow? 4. We are always satisfied with the weather. Oh, it rained on your family reunion Jane from Wilmington, NC? Cry about it. A sunny day for an outdoor event in Rochester is simply an added bonus. We cherish that sh*t. Still, we can have just as much fun in the rain, wind, snow, etc. as we can in 78 degree, sunny weather. 5. Isn’t there some type of study that shows that shivering uncontrollably on a consistent basis throughout the majority of your life burns calories and tones muscles? If not, someone should conduct one because I’m pretty sure that I’ve woken up sore after walking the entire length of the Pittsford Wegmans parking lot in -6 degree weather. Our summer bodies will thank us. We think Corey Condello‘s blog is the bee’s knees. She’s really got it all, this kid. 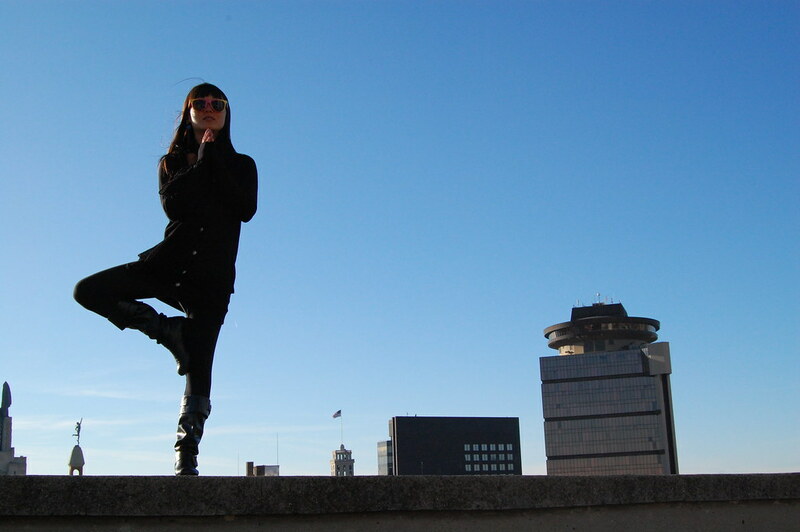 We’re proud to present her as the upstanding example of citizenry that is typical of born and bred Rochesterians… and if not upstanding, certainly swaying in vrksasana, high above us on a chilly day. Mercury must be happy for the rare company. Good thing we’re on twitter, huh Corey? Its such a wealth of talented ROC bloggers. Holla back whenevs!